Halloween is a fun and festive time of year. Stores are stocked with tons of decorations, costumes, and of course, my favorite, chocolate. However, for our pets Halloween can be scary and stressful. For a couple of hours their world is turned upside down with ringing doorbells and excited kids. In addition, the candy bar that’s mistakenly dropped on the floor could be hazardous to their health. 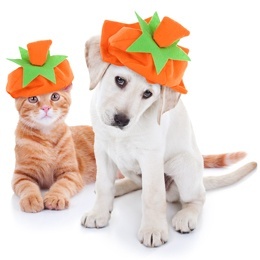 Here are some tips to help your pet endure and stay safe this Halloween. 1. Be careful with pet costumes. Our pets can look adorable or ghoulish in their Halloween costumes that make for great pictures. If you decide to dress them up, make sure costumes are simple and loose fitting. Detailed costumes can make it difficult for pets to move and cause injury if they get spooked and take off running. If you try a costume on and your pet seems aggravated or upset, it’s probably best to avoid using a costume this year. 2. Avoid choking hazards. Elaborate costumes can contain buttons or other small pieces that may entice your pet to chew on them. 3. Keep your pets indoors. If your pets want to sit on the front step with you and hand out candy, it’s probably best to leave them inside. The number of trick-or-treaters can be overwhelming to them. In addition, this can help prevent our pets from being teased by ghoulish guests. 4. Keep decorations out of reach. Decorating your home for Halloween or any holiday can be a fun family tradition. However, it’s best to keep decorations out of our pets’ reach. Wagging tails and excitement can cause them to knock things over. Nobody wants a Halloween fire caused by a knocked over candle or jack-o-lantern. 5. Keep your pets in a safe place. The constant ringing of the doorbell and the large number of visitors may stress out your pets. Keep them in a bedroom, away from all the noise and commotion. 6. Make sure your pets are wearing their ids. Some pets will do whatever they can to get outside. With your door opening and closing numerous times and all the commotion, their escape can be easier than normal. If they’re wearing their ids, they can be safely returned to you. 7. Secure your electrical cords. If you’ve lighted Halloween decorations on an end table or fireplace mantle, secure the cords appropriately. An excited pet may be tripped up. If your pet is showing signs of illness or you think your pet may be poisoned, contact your local veterinarian or the Pet Poison Helpline immediately. The sooner you seek medical treatment the better off you and your pet will be. 9. Apply Grannick’s Bitter Apple spray. If you find your dog or cat enjoys chewing on your newest Halloween decoration, apply bitter apple spray. The spray is a non-toxic, safe, and effective chew deterrent.